Coming from the well-known Cozy Games software, Merlin Bingo is a site with a unique theme. Although many of its games and bonuses are similar to those of other sites, it is designed around a magical kingdom which we think will intrigue players. Merlin Bingo offers a selection of different games along with plenty of nice promotions and deals when you sign up. In our Merlin Bingo review, we have tried and tested all the different features including the gameplay, bonuses and overall user experience. So is it a no or a go? Let’s dig into some of the factors. At Merlin Bingo, you get to choose from a wide selection of bingo games. The site offers 30, 50, 80, 75 and 90 ball bingo! None of the other sites offer so much to choose from. There a lot of medium-sized (£1000-£2000) jackpot games too apart from the regular scratch cards and casino games. You won’t find the bigger slots games like Fluffy Favourites or Jewel Journey Slots at this site. The slots games here are lesser known ones. Games with names like ‘Mystic Wilds’, ‘Five Pirates’ and ‘Honey Bees’ are to be found here, but there is nothing wrong with them as they are fun too and offer up to £5,000 in jackpots, as stated on the Merlin Bingo homepage. 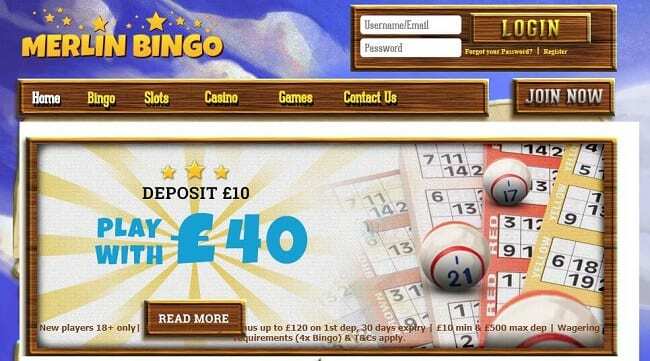 The Merlin Bingo bonuses when you sign up are pretty good as you can get a £30 bonus from your initial deposit of £10. This gives you a total of £40 to play with on the site. They also offer you the chance to get up to £3000 of free bingo in your first week. This is a very generous offer and we think it will appeal to new customers who want to make their money go a bit further. Merlin Bingo runs on the Cozy Games software and has a marmite effect on the players. The software is good enough and you may also love it, even though some people complain about it being complicated with too many options. But once you get a hang of it, it’s pretty easy to navigate through it. If you like to participate socially in the bingo games, then the chat room feature of the website might appeal to you. Otherwise, you will just find it annoying. Yes, you can enjoy the games on the go. It is available for both iOS as well as Android platform. Just sign in with your Merlin Bingo login and use the mobile web browser on your phone or tablet to access the website. Plenty of mobile-friendly bingo websites are available, click here to see some more that we recommend. We think it’s great when brands offer mobile compatibility as many players enjoy using smaller devices rather than a desktop computer or laptop. Have a look at our Hunnie Bingo review as well for another mobile-friendly brand from the same software. Considering all that Merlin Bingo offers, it definitely is worth a try. At least you can make the most out of the £10 no deposit bonus which you get on registration. You can then decide if the games are as per your taste or not. Also, remember that the site is totally authorized by the UK Gambling Commission, making it safe. There aren’t many ‘safe’ sites out there. Give it a shot if you enjoyed our Merlin Bingo review. You’ll probably enjoy it.